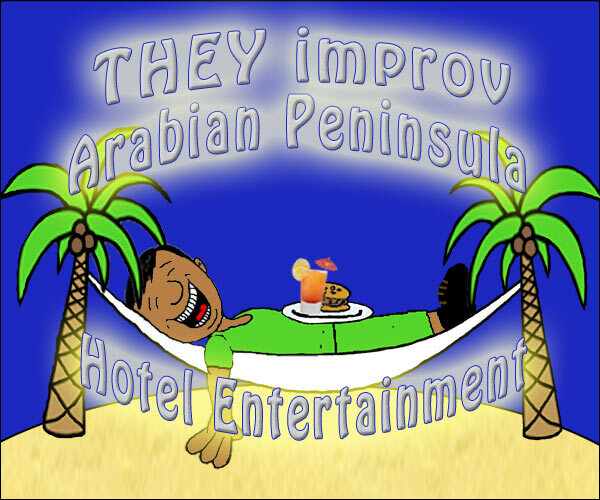 THEY improv provides Arabian Peninsula luxury hotel entertainment programs that can be brought to any of the resorts in the region. THEY provide a variety of options to entertain a wide array of audiences in multiple ways. 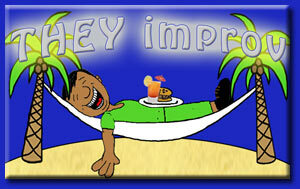 With sketch and improv comedy, game shows and murder mystery dinners for entertainment, scavenger hunts and mini-Olympiads for activities, crafts, games and comedy class programs to entertain kids and families alike, and hospitality training programs for staff, the real advantage to hiring THEY improv is the ability to multi-task and prove more useful than hiring separate groups for individual elements. While Arabian Peninsula Hotels generally have less land and activities that their resort counterparts, there is a lot of blurring the lines between them. We offer much of the same to both types of properties, though we have noticed that hotels have a strong desire to work on adding entertaining options to increase the revenue stream from guests by keeping them on property. We can help keep guests entertained on location and thus keep the business in-house, enhancing the bottom-line. After all, we have been working with American clientele for years, what better way is there to keep American guests in the hotel than to offer them American entertainment? Murder Mystery Dinners - While not always performed during a meal, these shows vary from being strictly a stage show, an interactive show, an immersive show to shows that utilize audience members as characters in the shows either as willing participants or as part of a stand-up comedy routine that we call the Frick & Frack Show. These shows range from 45 minutes to 3 hours depending on your desire. This can enhance your restaurant and catering business.Though less common, we could create murder mystery weekends to keep people engaged over a couple of days. Once you contact our director we'll discuss your needs and come up with a custom designed package for your Arabian Peninsula hotel entertainment within your budget and as logistically friendly as possible. This includes getting an understanding of the time commitment for the performers, the desired activities, amenities for the performers and points of embarcation/debarcation. THEY improv can provide these services in Saudi Arabia, Bahrain, Kuwait, Oman, Qatar, United Arab Emirates (UAE), Yemen, and practically everywhere else in the Arabian Peninsula as well. Some circumstances may require travel or legal documentation that may add to the fee. Simply ask us as we develop a proposal for your event.